Macular dystrophies are a group of genetic retinal disorders affecting the macula. They usually are transmitted as a dominant trait, meaning that an affected individual has a 50% chance for each child getting the disease. Many patients are completely asymptomatic, although some can develop central blurriness or distortion. The most common type is adult-onset foveomacular vitelliform dystrophy, also known as adult-onset Best’s disease. How is a macular dystrophy diagnosed? Most macular dystrophies are detected during a dilated ocular examination. 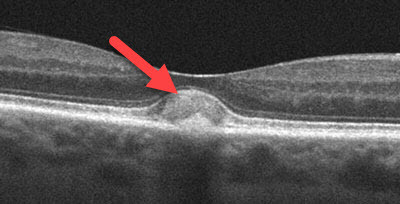 A central yellow spot or a variable pattern of yellow spots is seen in each macula. OCT scanning and fluorescein angiography are often used to confirm the diagnosis. Patients are often misdiagnosed as having age-related macular degeneration since the findings can appear somewhat similar. How are macular dystrophies treated? There are no specific treatments for the underlying genetic changes, although most patients do well. 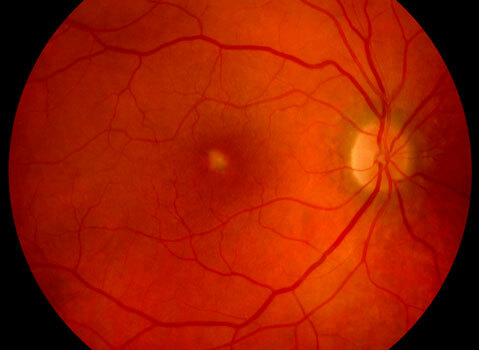 There is a small chance of new blood vessel growth below the retina (macular neovascularization) that can cause more severe central vision problems. Patients are therefore asked to check their vision regularly with an Amsler grid and see their eye doctor emergently if any changes develop. This can be treated in a similar manner as for patients with wet age-related macular degeneration.